Got an itch for more pranks to play at home? Scratch it here. This is one of the most economical pranks to play, as far as pranks that require props go. You'll need to get a remote controlled spider and place it near your unsuspecting victim. Sometimes it's really helpful to point out that there's a 'creepy crawly' near their feet to get them the first time. When they start to suspect that it's fake, make the spider move to scare them silly for the second time. This is an economical prank that can be used almost anywhere. I've included some videos of people who have played variations of this prank. Hopefully you'll get hours of fun with your scary RC toy! 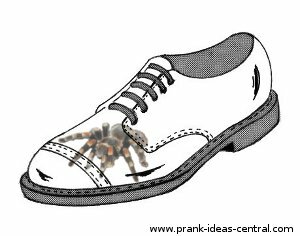 You'll need to a fake rubber spider (or anything else your victim might be afraid of) and put it into your victim's shoe. Stuff it deep into the shoe where the toes will touch, then wait for your victim to put on his or her shoes. When your victim feels something and tries to pull it out, get ready to savor their frightened reactions. To me, this one of the few good pranks to play at home in terms of shock value on the victim. In this prank, you're going to present breakfast in a familiar way, but with an unexpected frozen surprise. If your family is used to having the milk and cereal for breakfast, grab a bowl (or bowls, if you're pranking more than 1 person) and fill it a quarterway full with milk and some cereal, then put it in the freezer overnight. Volunteer to get breakfast for everyone, then take out the bowls with frozen milk and add a thin layer of fresh (unfrozen) milk and a sprinkling of cereal on top. Serve it to your unsuspecting victims who will be surprised when they spoon the iceberg beneath the milky seas. This is one of the more amusing pranks to play at home as it hits the victim when they are at their least suspicious and groggy in the morning. Grab a box of cereal and remove the inner packaging along with the cereal (don't open it yet). Cut a hole at the bottom of the box, preferably a rectangular and regular one so that the box can remain standing. Put the box back on the table. Now open up the inner packaging by the top. Reinsert it into the box upside down so that if your victim peeks into the box it will appear as if the inner packaging has not been opened. When your victim tries to lift up the box, a shower of cereal will come pouring down. Does someone love to drink cola from the can at home? Open up a can and add some soy sauce to their cola, or salt - and lots of it. The cola will lose its fizz and taste a tad bit salty. Then reseal the can (see the video to learn how). Be prepared to replace the cola for your victim though, as this prank will render the can undrinkable. This prank just exploits the cuteness (and cluelessness) of your pets. Simply place saran wrap where your pet normally runs through. Then call for them, and watch them run through the wrap. This is the standard prop a jug/bucket/recepticle of water above the door trick. I included this video because of the mechanism of the jug that allows the door to stay closed. The trade-off is that it carries much less water than a bucket, but it works!